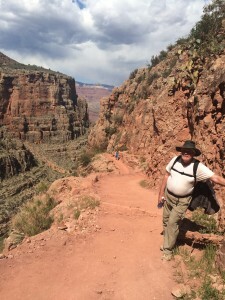 When I hiked to the base of the Grand Canyon and back up to the South Rim in April at age 39, it wasn’t supposed to be about me. It was about my dad, recently turned 74, and his lifelong dream to descend to the Colorado River and back up again before he died…and while he was still physically able to do it. Against my mother’s protests, I took it upon myself to make sure he got his wish. Don’t think me callous. I adore my dad, always have. He has been the sole, relentless, indefatigable cheerleader of every outrageous and stupid life plan I’ve ever had. And I have always believed he deserved better than to end his life suffering in a hospital bed. Live large, die large. That is what he taught me. However, if you’ve never entered a landscape (figurative, literal, or both) that has brought you in the closest possible proximity to the depth of your weaknesses and the heights of your strengths, you might find this entire blog post a little hard to grasp…. 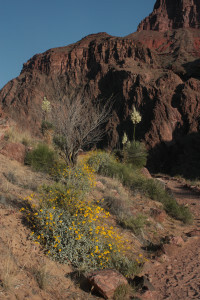 Here’s the thing: I started that two-day trek to the canyon’s base and up again about 9 a.m. on a cold spring morning, exhilarated and a little bit hesitant. Had I trained enough? I knew I could do a two- dozen-mile hike but with a pack weighing over 30 pounds while descending and then ascending over 4,400 feet? Carrying all my stuff and a good chunk of Dad’s? In an environment that I knew would range from close to freezing to possibly into the 90s in the span of a single day? Dad and I spent the first six or seven miles walking together. 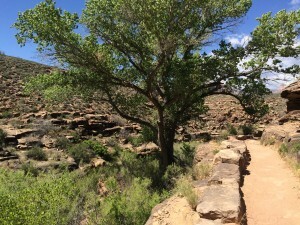 By late afternoon, I was well ahead (but within sight distance of him), nursing screaming knees from hours and hours of relentless downhill, creeping down the unforgiving red rock of Devil’s Corkscrew, tears forming in my eyes, first from the pain in my knees…then from the pain in my heart. Because this wonder of the world landscape doesn’t just pull at your heartstrings; it rips them. Rips them till you’re stuck in your own head, limping down a steep trail, your eyes riveted by the ever shifting rugged and unforgiving beauty of the surrounding canyon walls, the sheer marvel of a tree and grass laden oasis bisected by a cool stream, rock formations squatting like compressed biscuits cradling Indian Creek, then the vista opening again to views of miles and miles across rusty red mountains with cascading waterfalls, sun-catching desert blooms, and the promise of a first look at the mighty Colorado River that helped shape this canyon over the course of millennia. You have to see it, live it, endure it. And by the time I’d finally traversed Devil’s Corkscrew onto relatively flat ground, given half my water to an idiot, dehydrated hiker who thought she could go rim-to-rim in a single day with no food and one water bottle, I was deep inside my head, at least a quarter mile ahead of Dad, my brain marauding into the no man’s land of life’s relentless disappointments, lost loves, unwillingly discarded dreams, and then those brief and fleeting moments of joy. I had laughed when park rangers said this hike would change me. 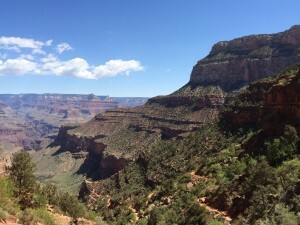 Because there were points along the hike, my clothes soaked with sweat, hiking shoes disintegrating at the seams, and filling my toes with dry sand, that I wondered why I had thought this was a good idea. Wouldn’t I rather, especially when in the midst of that final four-mile push up a near vertical trail at the end of day two, be nursing a Manhattan while watching Mad Men? And damn it, yes, I would! Before you go and get all bummed out, think for a moment how much of human grief, particularly in Western culture, comes from the misguided belief that life is about the pursuit of happiness, that love is supposed to bring us happily ever after and eternal joy. 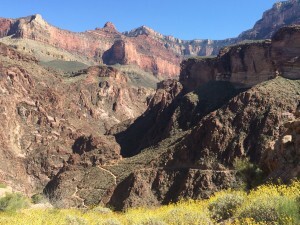 I didn’t initiate this Grand Canyon hike hoping for fun or for joy. I initiated it to make my father’s life richer…and my own as well. It was, like so many things I have done, part of my relentless effort to say “yes” as much as possible. And to try to inspire others to do the same. Plenty of my life’s “yeses” have resulted in suffering, anxiety, fear…but also in walking through pain, surviving panic, and facing terror head-on. Rest assured, I do not believe that what doesn’t kill you makes you stronger; in fact, it can often make you weaker—less prone to take future risks, less likely to give in to vulnerability, less inclined to sacrifice for love. So really the only decision you have to make in this life is “yes, I’ll go in.” And that’s the decision over which so many of us (myself included) waver. But the fact is, four months later, when I returned to the Grand Canyon, this time on the North Rim, with my seven-year-old daughter, and stood with hundreds of other tourists looking down from Bright Angel Point to the squarish cliff behind which the interpretive sign told us was Bright Angel Campground (where Dad and I had pitched a tent just north of the Colorado River), I regretted I was standing there, nothing more than an observer of a vast landscape. An observer, not a doer. And suddenly, my mind was filled with ideas of heading down into the depths of that brutal and marvelous landscape again, for days, to wander the trails not yet taken, to see all the places one can only see on foot, with courage, with endurance, with a willingness not necessarily to find happiness, or joy…but grace.